Our licensed, English-speaking guide and your chauffeur will meet you in the lobby of your hotel with a name board. 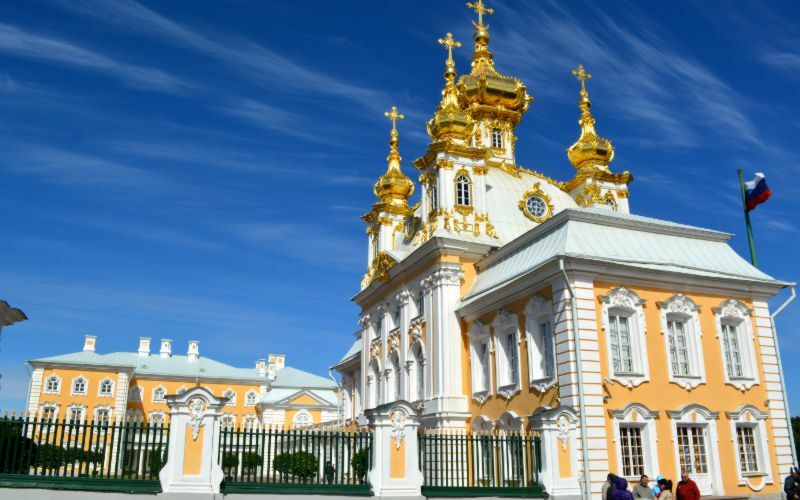 Your chauffeur will drive you and the guide in a comfortable vehicle to the Peterhof residence, which is located approximately 40 km outside of St. Petersburg. 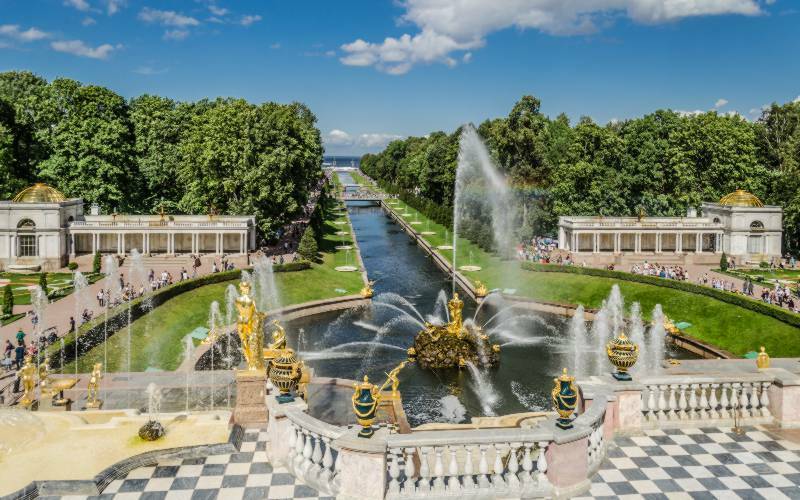 The Peterhof Grand Palace consists of 173 fountains, 3 large cascades and a number of Palaces. Together with your English-speaking guide, you will visit the Palace with its shiny cupolas and the marvelous East Chapel, the Chesma Hall with paintings of the Battle of Chesma, the East and West Chinese Cabinets, the Picture Hall and other rooms within the Palace. You will have the chance to enjoy the beauty of the Peterhof Fountain Park with its romantic atmosphere and picturesque views. There are more than 60 fountains, which up to today operate without the use of pumps, working exactly as they have been designed as more than 300 years ago. Visit the various chapels in and around Peterhof, including the Gothic Chapel within the Alexandria Park of Peterhof. The Church was designed in Gothic Revival style, with 43 copper figures lining the walls. Visiting the chapel from outside is included in the tour. If you wish to enter the chapels and visit them from inside, additional tickets need to be purchased. If you would like to include the delightful Catherine Palace in Tsarskoe Selo in your day tour, LingoTaxi would be happy to offer you a full day tour package. Please have a look here for more information. 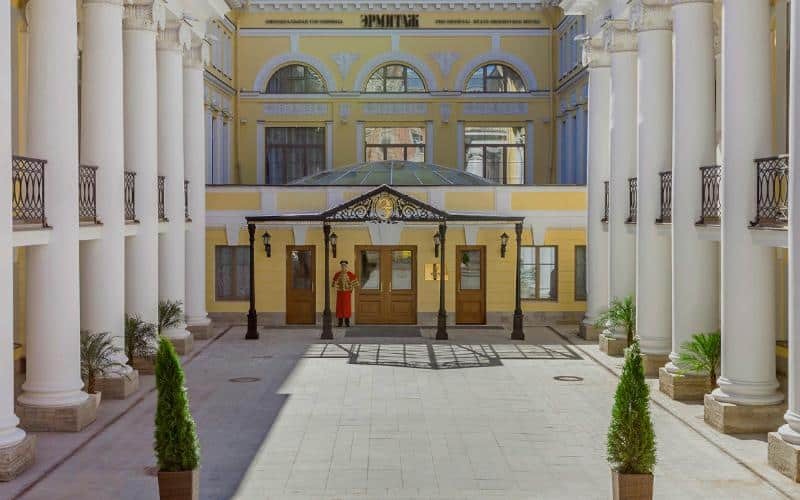 At the end of your tour and visit to Peterhof, your personal LingoTaxi chauffeur will drive you and your group back to your hotel, airport, cruise port or any other place in the city center that you prefer. 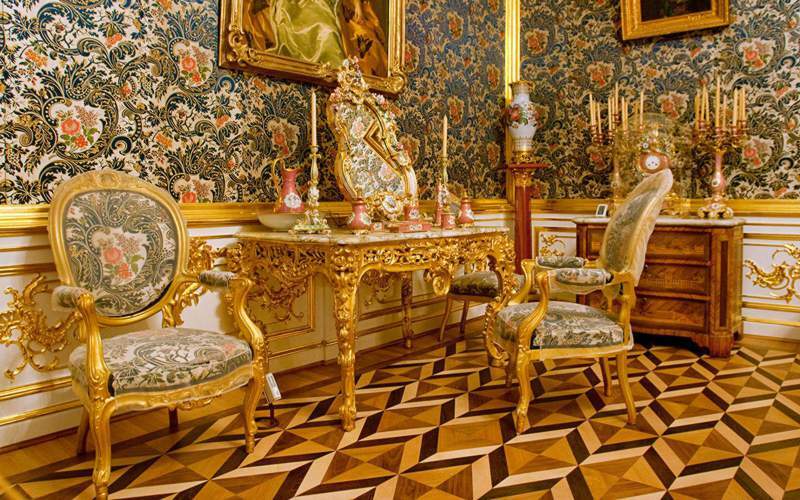 Your private tour to Peterhof Palace has to be booked minimum 1 week in advance. Once we receive your reservation and a deposit (prepayment) by PayPal or credit card, the LingoTaxi team will purchase all required tickets for you, organize the transportation as well as an official, licensed English-speaking* guide for you. 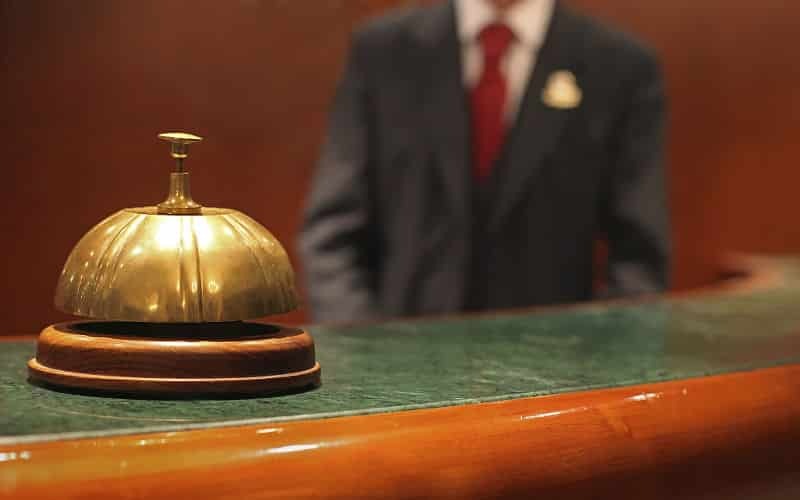 Your private LingoTaxi driver as well as your English-speaking guide will meet you in the morning in the lobby of your hotel. Together, you will drive in a comfortable vehicle to the Peterhof Palace, approximately 40 km outside of Saint Petersburg. Once you arrive at the Peterhof Palace, you will be able to enter the Palace immediately to start your tour. You will skip the long waiting lines - your tickets have been already purchased by LingoTaxi. After an extensive tour through the Palace and its marvelous rooms, you will be able continue on to the fountain park and the East Chapel of the Peterhof Residence. 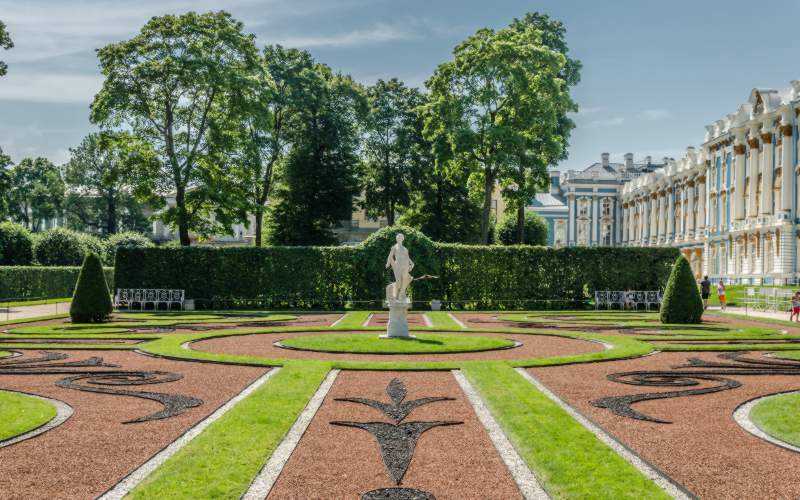 Relax and enjoy the beautiful gardens surrounding the Peterhof Palace. At the end of your visit to the Peterhof Palace, your chauffeur will drive you back to your hotel in the city center. The booking process is fairly simple. You can fill in the form on this website to receive a price quote for the tour that you would like to book. The fare depends on the size of your group. Are you travelling alone, as a couple or with your whole family of seven? Absolutely no problem! We can facilitate and offer our Peterhof tour to any group size from 1 to 10 persons. If you have any open questions, you can contact us by phone, email or chat. Or just simply fill out the question form, and our team gets back to you by email as soon as possible.